This set include working space, fixed arm and vacuum with controler. If you want to work soon, we advised this set and at least Cosmo super 100 or Cosmo super 24(with air) together. This set include working space, free arm and vacuum with controler. This set's character is free arm. This set include working space, fixed arm vacuum with controler, Cosmo super 100(two machine), balancer(two balancer) and dryer. 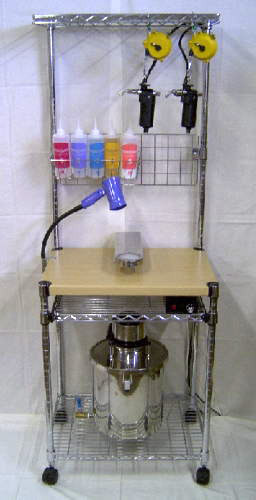 This set include working space, fixed arm vacuum with controler, Cosmo super 100, balancer, dryer and steam gun. This set include working space, fixed arm vacuum with controler, Cosmo super 100, Cosmo super 24(air model), balancers(two balancers), dryer, and steam gun. This set include working space, fixed arm vacuum with controler, Cosmo super 24(Revised Edition), Cosmo super 24(air model), balancers(two balancers), dryer, and steam gun. This set is the first class set of we have. Please look at other page about machine for further details.